Labor organizing is gaining renewed momentum among some Amazon employees in the United States. The retail giant—run by the richest man in the world—is now one of the largest employers in the country, with more than 125,000 full-time hourly associates working in its fulfillment and sortation centers alone. Throughout Amazon’s 24-year history, portions of its enormous US workforce have attempted several times to form a union, but the company has consistently—and successfully—fought back. Now, amid a tight labor market, workers in Minnesota have succeeded in getting management to meet some of their demands. On Friday afternoon, they staged a protest at an Amazon facility on the outskirts of Minneapolis to ask for even more. Over the summer, a group of East African Amazon workers in the Minneapolis area began negotiating with Amazon to make compromises around Ramadan holiday hours, better responding to worker complaints, and building a dedicated prayer space in the Shakopee fulfillment center. Unsatisfied with the pace of progress toward improving working conditions, the group rallied a few hundred people, including local teamster chapters, to the Shakopee facility parking lot Friday afternoon to demand that Amazon reduce productivity rates to safe levels, respect the cultural differences of Muslim East Africans, and invest in a community fund to aid in affordable housing for workers. At 4 pm, as the winter sun was setting on the Shakopee business park, about 30 workers walked out of the fulfillment center to the cheers of the crowd gathered on the edge of the property. “Haa aan awoodno!” they chanted, which means “Yes we can” in Somali. Abdukadir Ahmed was the first one to reach the crowd. Tall and thin with black fleece earmuffs covering his tight curls, the 35-year-old arrived in Minneapolis from Egypt in March of last year, and has been working at Amazon as a package scanner for a year and a half. On a typical day, he says, he will work a 10-hour shift, and scan and rebin up to 600 packages each hour. “They’re always pushing, pushing all the time,” says Ahmed. “Nobody appreciates us, they just treat us like robots.” He’d like to see his hourly rate drop to something more like 180 packages per hour. For about an hour, protesters clad in parkas and khamiis shivered in freezing temperatures as they listened to organizers speak about taking back some of Amazon’s billions for local Minnesota communities. Around 5 pm, the group marched to the facility’s front doors to deliver its demands to managers inside. They were stopped by a dozen Shakopee police squad cars and told to leave the premises or they’d be arrested for trespassing. Organizers corralled the rally back to the street, with shouts of “Amazon, we’ll be back” trailing behind them. Ashley Robinson, a spokesperson for Amazon, said in a statement that the company has an “open and direct dialogue with employees” in Minnesota. She says the average pay for Amazon workers in the state is between $16.25 and $20.80 in addition to full benefits; the minimum wage in Minnesota is $7.87. “I encourage anyone to compare our pay, benefits, and workplace to other retailers and major employers in the Shakopee community and across the country. We invite anyone to see for themselves and take a tour through our fulfillment center tour program,” the statement reads, in part. The workers in Minnesota are not alone in demanding that Amazon change its labor practices. Over the summer, employees at the Amazon-owned grocery chain Whole Foods began moving to unionize with the Retail, Wholesale, and Department Store Union following layoffs. 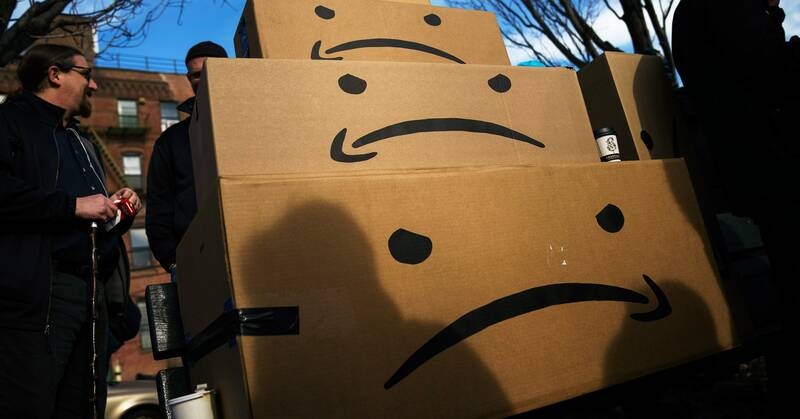 On Tuesday, Bloomberg first reported that a group of employees at a recently opened Amazon fulfillment center in Staten Island are also organizing a unionization campaign with RWDSU. Workers there say they are concerned about safety issues, inadequate pay, and unreasonable hourly quotas. For now, the specifics of how they plan to obtain union recognition aren’t clear. Several pro-union Amazon employees attended a press conference outside New York City Hall Wednesday morning, ahead of a hearing about the company’s proposed “second headquarters” in Long Island City, Queens. Last month, Amazon announced that it had chosen Long Island City to be the site of one of its new mega offices, where 25,000 white-collar employees are expected to eventually work. The secretive deal, which netted Amazon over a billion dollars in governmental incentives, has incited a backlash among some local residents and politicians. The Staten Island organizers plan to use the HQ2 deal as leverage for their own efforts. “My hands hurt all the time. I can’t even write,” Sharon Bleach, a Staten Island Amazon employee, said outside City Hall Wednesday. Bleach, 60, has worked at the company for only a month, and said she is forced to work with boxes stacked up all around her. She worries there would be no way to escape in the case of a fire or accident. In response to Bleach’s concerns, Robinson said she should talk to her managers and that “all exits and walkways are clearly marked and kept clear.” She added that Amazon surveys all workers each month about their perceptions of safety conditions. Amazon’s employees do have several factors working in their favor. For one, the labor market is extremely tight in the United States right now; the unemployment rate was at 3.7 percent in November. Amazon’s employees are also part of a wider renewed interest in unionizing among some workers, particularly millennials, says Milkman. “That was also a factor in the wave of teachers’ strikes earlier this year, and in recent unionization drives among adjunct faculty and graduate students,” she says. Hundreds of Columbia University teaching and research assistants went on strike in August, for example. Milkman added that many online publications have also recently unionized. Amazon’s labor practices, as well as the government incentives the company has received, also face growing scrutiny from some lawmakers. In September, Vermont senator Bernie Sanders introduced legislation called the Stop BEZOS Act, which is designed to encourage large employers to raise wages by taxing them when employees are forced to rely on public benefits like food stamps. The bill was accompanied by a campaign that encouraged Amazon workers to share their experiences of working at the company. Shortly after the legislation was introduced, Amazon announced it was raising its minimum wage to $15 for all US employees. Amazon has fought back against unionization campaigns in the past. When a small group of maintenance and repair technicians moved to unionize at a Delaware Amazon warehouse in 2014, the company hired a law firm that specializes in opposing organized labor. The employees eventually voted not to join the International Association of Machinists and Aerospace Workers. Union membership in the United States has declined significantly in recent decades. In 1983, 20.1 percent of American workers were part of a union, compared to only 10.7 percent in 2017. Should even a fraction of Amazon workers become unionized, it would be a significant milestone for organized labor across the country. But a lot needs to happen before reaching that point.